In case you haven’t noticed…it’s hot out there. Record heat is sweeping the nation, and according to Weather Channel Meteorologist Mark Ressler, over 1,000 high temperature records have been broken in the month of July alone. The extreme heat poses the most risk for seniors, individuals with pre-existing medical conditions, and those working outside or in a factory. Most of us can escape into air-conditioned comfort to “beat the heat,” but some of us, factory and warehouse workers in particular, are not so lucky. In a warehouse environment, temperatures can easily exceed those outside by more than 20 degrees. The danger is very real. Heat stress can cause a number of issues. Heat stroke, exhaustion, cramps, and rashes are some of the most common problems caused by the intense heat. However, the high temperatures and humidity also increase the risk for workers being injured on the job thanks to sweaty palms, fogged-up safety glasses, and dizziness. In these instances, Panel Built would recommend a “cool room” for employees in high temperature areas to cool down periodically throughout the day. Even when temperatures rise well above 100 degrees, a “cool room” by Panel Built can provide a climate controlled shelter with temperatures in the 70’s thanks to our optional poly-iso 95+ core which can provide a greater R-value than the standard polystyrene. 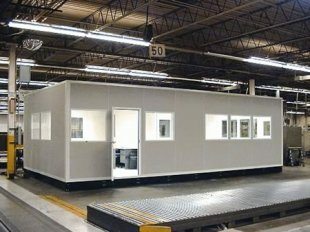 Not only is this a great solution to keep workers safe and happy, but our modular “cool room” on a fork/crane-lift able steel base can be moved around your facility as your business expands, relocates, or re-arranges the work area.